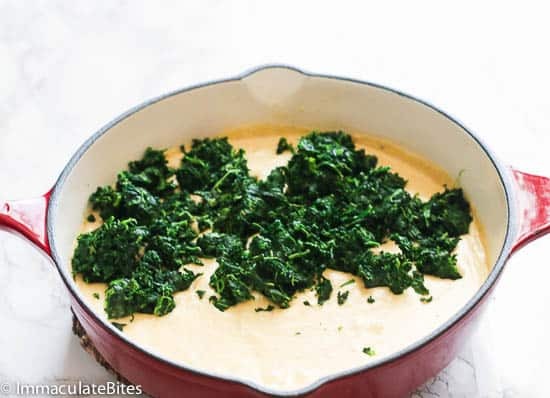 Creamed Spinach Recipe – tender wilted spinach draped in a smooth white sauce infused with garlic, onions, creole seasoning, nutmeg and melted cheeses. A great easy holiday side dish for your favorite roasted chicken, steaks and turkey! The holiday season isn’t meant for low-carb and lesser calorie dishes. We typically just set aside our calorie counter and happily indulge on good food. And we do know what “good food” means during the holidays, right? What I do notice is that anything creamy (like this Creamed Corn) is always a big hit. Agree? 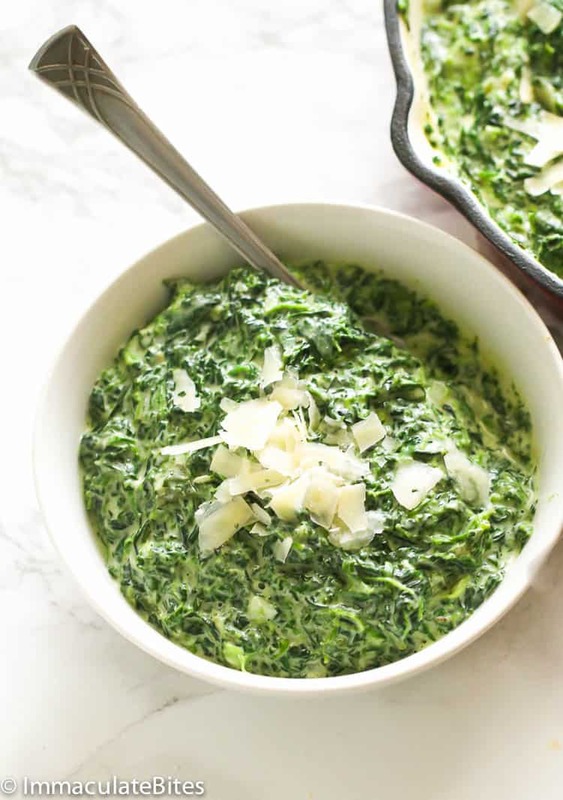 This creamed spinach is no difference. 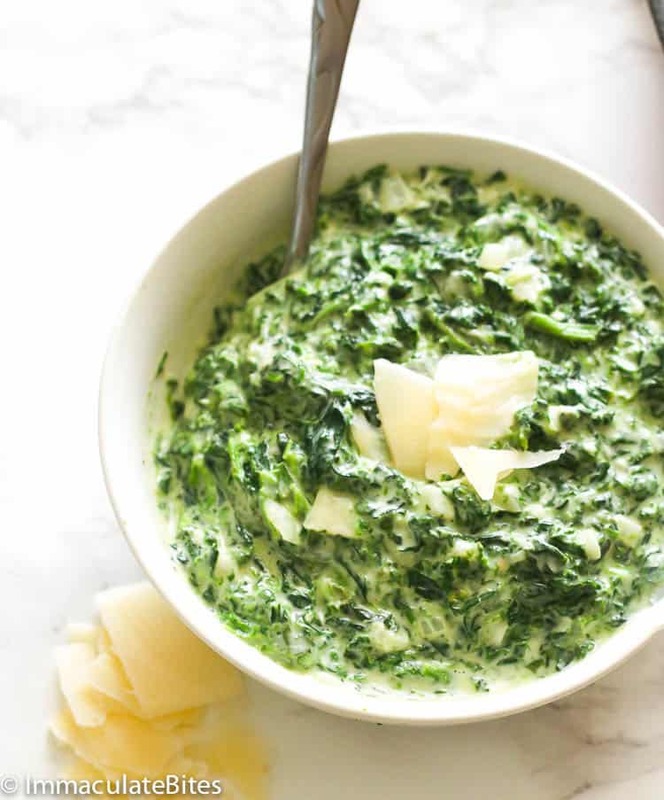 It takes your favorite green leafy vegetable into a luxurious side dish with the right amount of milk and cream plus cheese. It’s pretty simple to throw together, too. You just have to mix the white sauce, season it and throw in the spinach. 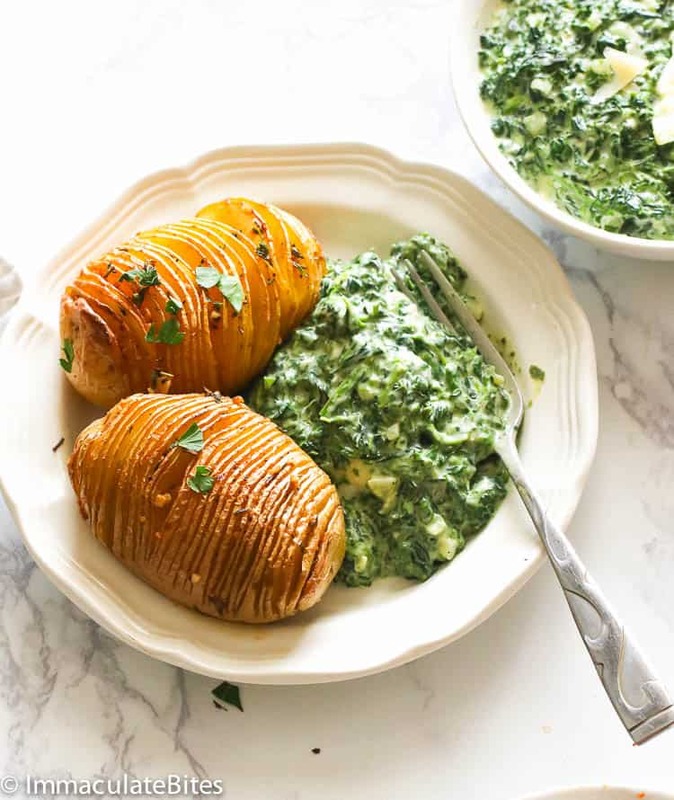 Creamed spinach makes a great accompaniment with fish, meat dishes and potatoes. 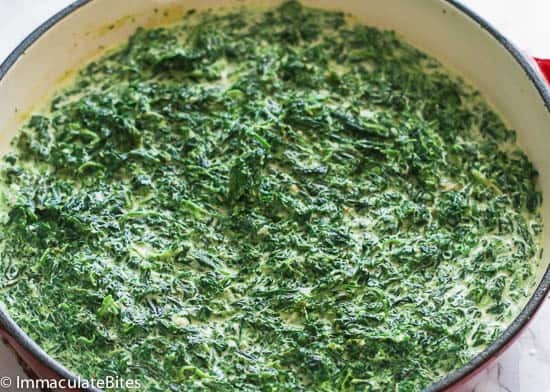 Is creamed spinach healthy for you? I grew up loving spinach. It’s one of my fave go-to leafy green veggie. Aside from how versatile spinach can be (you can add it to almost anything), it’s also packed with Vitamins K, A, C, Magnesium, Iron and Calcium. A cup serving of raw spinach contains only 41 calories. What’s not to love? However, it turns a bit unhealthy-ish when you turn it into this creamed spinach packed with processed milk and cheeses. But heeeey, it’s better than serving full fatty side dish, right? 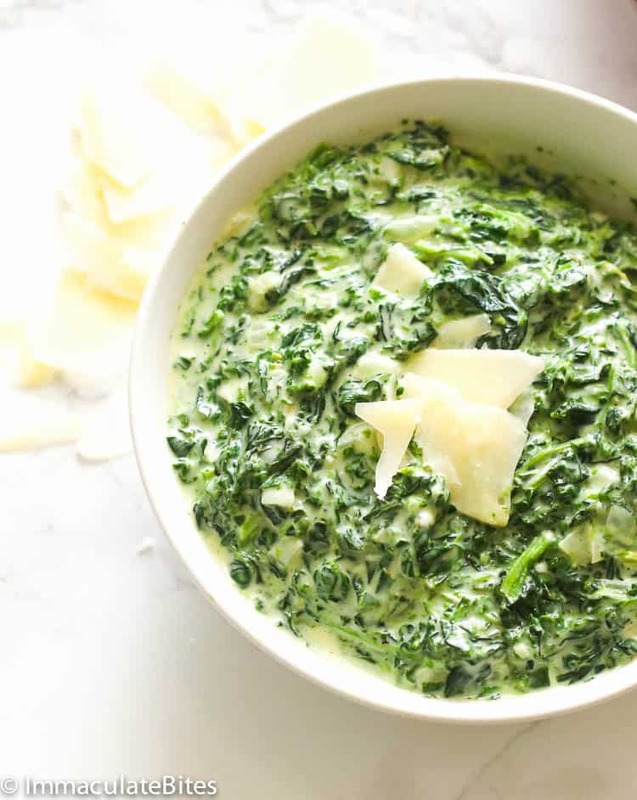 How do you make the best creamed spinach? 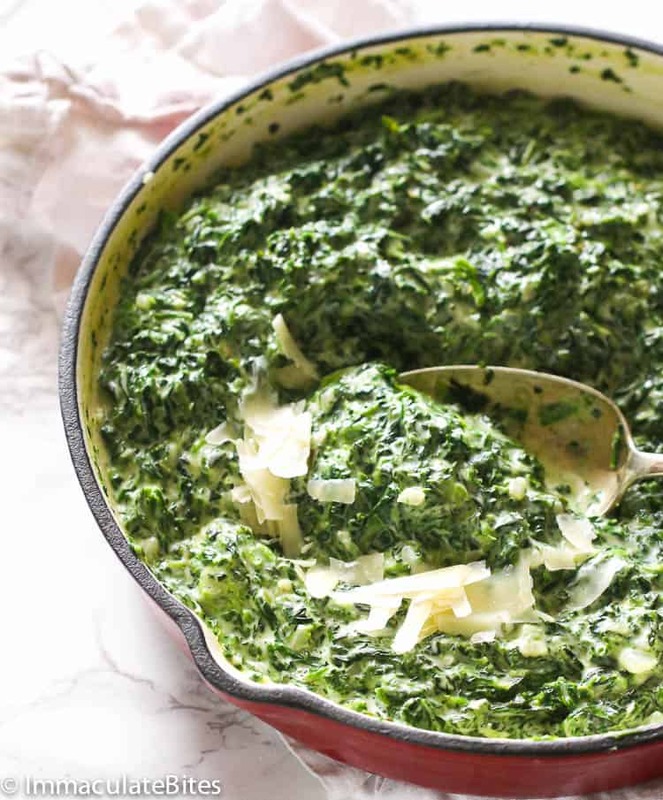 There’s nothing big in making the best creamed spinach. But I’d love to think that these three factors contribute how my creamed spinach is a cut above the rest. Nutmeg. It may seem like nutmeg is a dessert spice, but you’ll love that balanced flavor in this recipe. 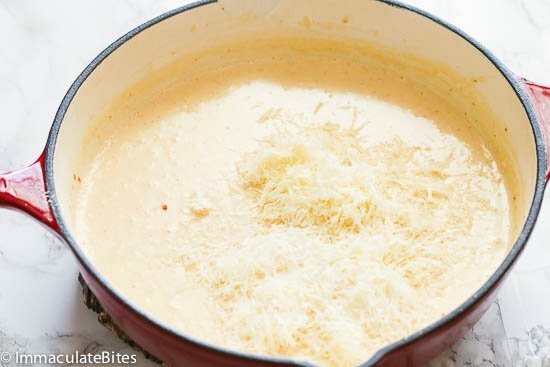 It also adds warmth to the creamy, cheesy flavor. All thanks to a half a teaspoon of nutmeg. It makes it oh-so-delicious! 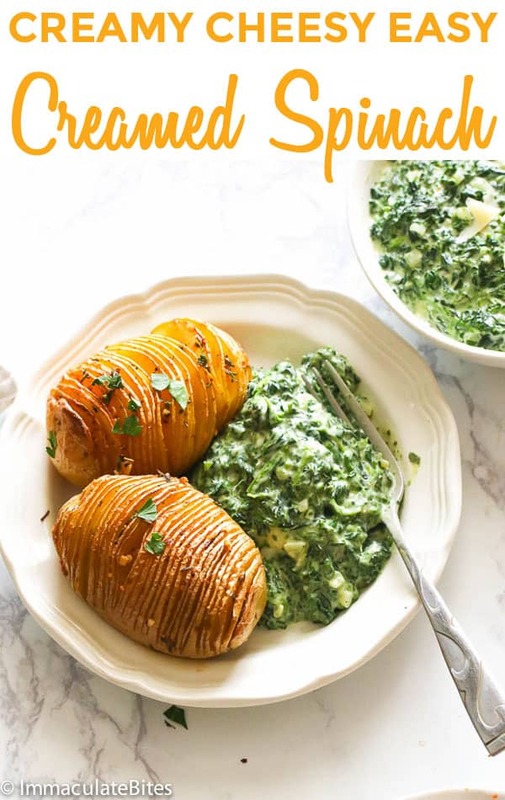 This creamed spinach only takes 15 minutes of cooking and is a great side dish for your roasted chicken, pork, beef and even turkey dish. 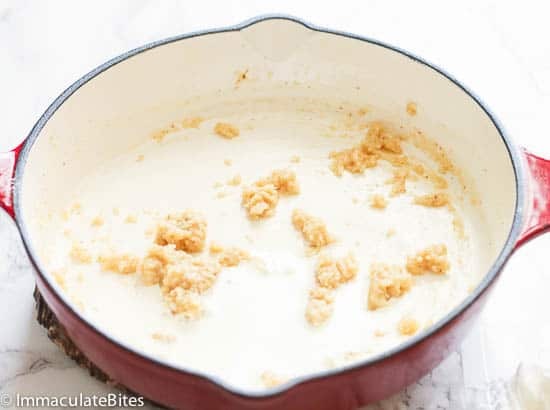 It’s worth every minute it takes – creamy and so delicious! Substitute Frozen spinach with 2 1/2 pound fresh spinach. 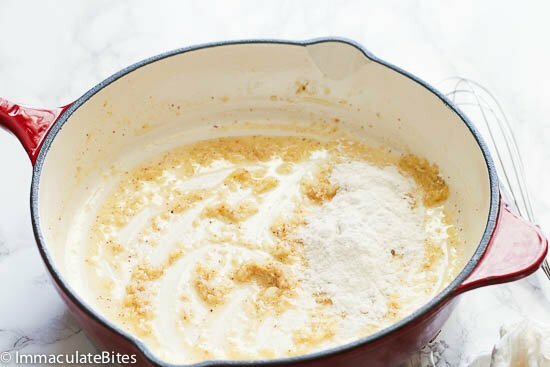 You may substitute all-purpose flour with almond flour, but not coconut flour as it is more absorbent and would affect the texture of this dish. 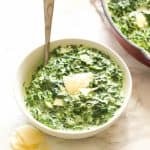 Creamed Spinach Recipe – tender wilted spinach draped in a smooth white sauce infused with sauteed garlic, ginger and melted parmesan cheese. A great easy holiday side dish for your favorite roasted chicken, steaks and turkey! In a large skillet over medium heat, add butter , let it melt then throw in garlic , onions, and creole seasoning. Stir for about 2-3 minutes or until fragrant Be careful not to let it burn. Add flour and whisk until flour is fully mixed with onion mixture , then cook for about a minute to get rid of the flour taste. Slowly add evaporated milk a little at the time, followed by the milk ; you do not want the mixture to form any lumps. Bring to a simmer and let it simmer gently , whisking constantly until the sauce has begun to thicken, about 3-5 minutes. 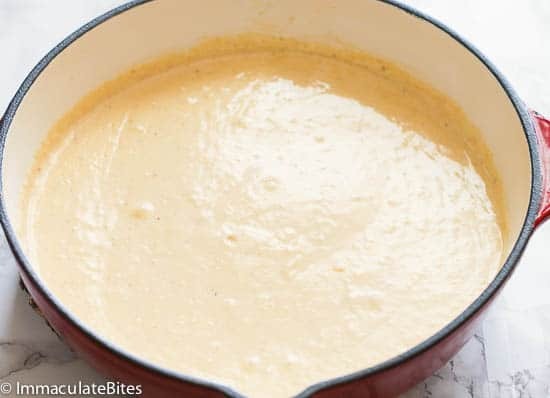 Stir in the cheeses, and continue stirring until everything’s melted and evenly combined and smooth. Add spinach, until well combined. Followed nutmeg and Worcestershire. Adjust seasonings to taste and additional liquid (milk or cream , if needed). Cook for about 1-2 minutes or until heated through. Remove from stove and serve piping hot. In a large skillet over medium heat, add butter, let it melt then throw in garlic , onions, and creole seasoning. Stir for about 2-3 minutes or until fragrant Be careful not to let it burn. Add flour and whisk until flour is fully mixed with onion mixture , then cook for about a minute to get rid of the flour taste. Slowly add evaporated milk a little at the time, followed by the milk ; you do not want the mixture to form any lumps. Bring to a simmer and let it cook whisking constantly until the sauce has begun to thicken, about 3-5 minutes. And continue stirring until everything’s melted and evenly combined and smooth. Stir in spinach, until well combined. Add nutmeg and Worcestershire. Adjust seasonings to taste and additional liquid (milk or cream , if needed). Cook for about 1-2 minutes or until heated through. Remove from stove and serve piping hot. One of my favorite veggie, and like you cheese makes everything better. Trying this Next week when I replenish my spinach. Can’t wait for you to try it, Teresa. Thank you for dropping by! 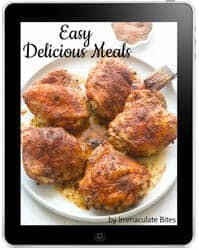 I’d really like to be able to Pin some of your recipes and without fail, I cannot. I’ve tried to pin at least half a dozen and I always receive the same error message – ” There is nothing to pin”.